From left to right, the vertical lines represent the 4th, 3rd, 2nd, and 1st strings on your banjo. Most banjo chord diagrams don’t include the 5th string, because you rarely fret it, especially when you’re just beginning to play. The top horizontal line represents the banjo nut. The nut is what guides the strings from the fingerboard to the peghead. One way to think of the nut is as a “0” fret, because your banjo strings are open at this location on the neck. The second line from the top stands for your banjo’s 1st fret, and the line below that represents the 2nd fret, and so on. The black dots that appear on the vertical string lines indicate behind what fret and on what strings you should fret. 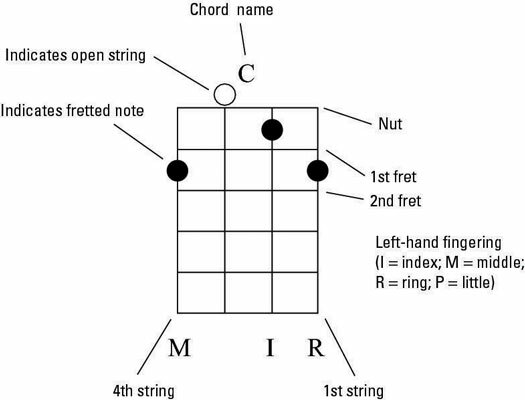 The letters located underneath the chord diagram indicate the left-hand finger you use to fret each string. For the left hand, I = index finger; M = middle finger; R = ring finger; and P (or sometimes L) = pinkie (or little) finger. Some books use the numbers 1 through 4 to represent the left-hand fingers in the same way. The banjo chord diagram for a C chord. Check out the chord diagrams for G, D7, and C chords in this figure. Of course, there are lots of other chords you can play on the banjo, and Appendix A has most of them. Some good advice is to tackle just one or two new chords at a time, practicing them when they appear in a new song. Don’t try to learn them all at once without playing a song where you can put them to good use. Chord diagrams for G, D7, and C chords.